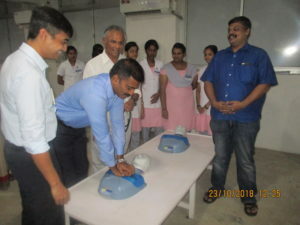 Dr. Jeyasekharan Hospital and Nursing Home in collaboration with Indian Resuscitation Council (IRC) & Indian Society of Anaesthesiologist (ISA) celebrated the World Restart A Heart Day on 23.10.2018 to increase awareness about the importance of bystander CPR/ COLS, education and training to the general public in order to increase the likelihood of lives being saved in the event of cardiac arrest. 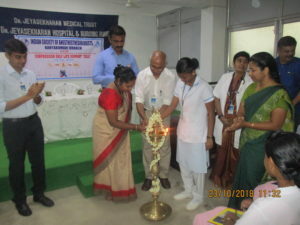 The programme started with Prayer song by Hospital choir at 11.30 am, followed by the welcome address by Mrs. Jeyalakshmi, Nurse Educator & AHA BLS Instructor. Lighting the Kuthuvilakku done by Dignitaries. 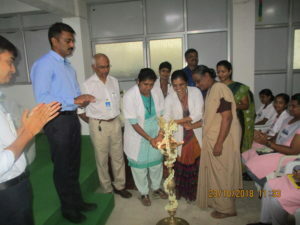 Dr. Devaprasth Jeyasekharan, Managing Trustee, Dr. Renu Devaprasath, Medical Administrator & HOD Dept of Anaesthesia, Dr. Nishal Perumal, Consultant Anaesthesiologist & ISA President, Dr. Jeyanthan Thandeswaran, Consultant Anaesthesiologist & COLS Chairman and Dr. Anand Karthik Consultant Anaesthesiologist & Treasurer ISA graced the occasion with their presence. Dr. Nishal Perumal, Consultant Anaesthesiologist & ISA President delivered the presidential address and he explained, how the bystanders Compressions Only Life Support can prevent brain death and keep the victim alive until he receives advanced medical help. 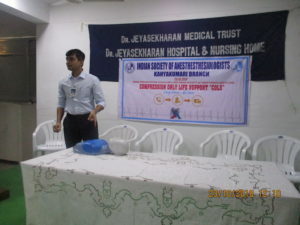 Presentation on ‘Compressions Only Life Support’ (COLS) was done by Dr. Jeyanthan Thandeswaran, Consultant Anaesthesiologist & COLS Chairman. He explained the content & Algorithm with pictorial presentation. It was very easy to understand. 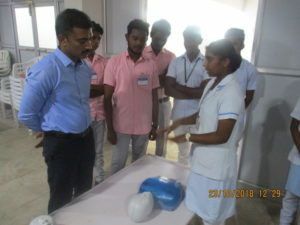 After the presentation the delegates were divided into 5 groups and they practiced the COLS under the supervision of instructors Dr.Jeyanthan, Dr. Anand Karthik, Dr. Geo Navin Jude, Mrs. Jeyalakshmi and Mrs. Lettishia and each participant had the opportunity to practice. Dr. Ranjit Jeyasekharan, Trustee motivated the instructors with his presence during the practice session. 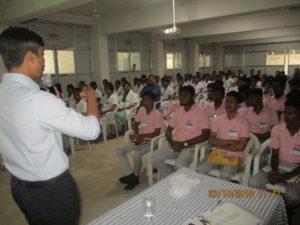 The training program was successful in meeting the objectives. 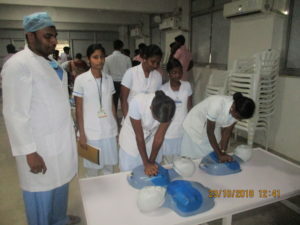 Through this program 93 students were trained in COLS and gained confidence to save lives. 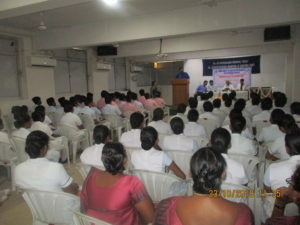 The registration and other arrangements made by Mr. Finlay Samson, Mr. Nagarajan, Udhayakumar & team were very good. Program ended at 1.00 pm.